Prince, say volunteers and staffers at the Mohawk Hudson Humane Society in New York say that Prince, who has been with them for 5 five months, is doing wonderful with his obedience training. But come night time, he has THEM trained! You see, since he arrived at the upstate New York animal shelter, getting tucked in is an important source of comfort. Some people may find it surprising, but pit bulls are a very emotional and sensitive breed. 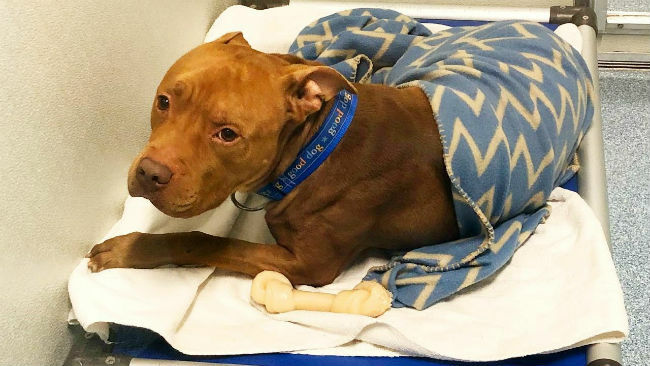 “Every night at closing, if someone gets into his kennel and gives him a toy, he climbs right into bed and waits to be tucked in with a blanket,” Mohawk Hudson Humane Society spokeswoman Marguerite Pearson said in a statement to InsideEdition.com. Prince came to the shelter back in April. His owner, unable to care for him, gave Prince to his girlfriend, but Prince slipped his collar, ran away and ended up in lock-up, attempts by the staff to reach her went unanswered. Prince is loving and affectionate and doing really well with his obedience training! To find out more about Prince, visit the shelter’s website.